Hogan's Heroes tells the story of United States Army Air Corps Colonel Robert E. Hogan, the senior prisoner of war at Nazi Luft-Stalag 13, a German prisoner of war camp for Allied air force personnel, and his multinational team of saboteurs as they deal with the war and their bumbling camp commandant, Colonel Wilhelm Klink. Each week, Hogan's Heroes would sabotage the Nazi war effort in some way under the nose of Colonel Klink and his sergeant of the guard, the pudgy Sergeant Schultz. While the camp was used as a center of spy activity and escape aids (the surrounding area was criss-crossed with tunnels and there were huge cave areas under the Stalag used as everything from radio rooms to barber areas), Klink maintained that "no one had ever escaped from Stalag 13" even as he was constantly outmaneuvered by the wily Hogan (or occasionally saved from being shipped to the Russian Front by Hogan, since it was made painfully clear over the course of the show's six seasons that the only reason they were able to use Stalag 13 as effectively as they did was a combination of Klink's incompetence and Schultz's indifference). 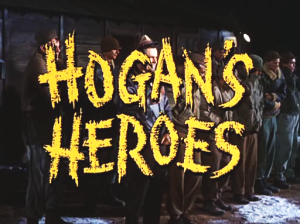 Hogan's Heroes, while popular, was eventually canned during a reorganization of CBS's evening schedules that also saw the departure of several other popular shows such as The Beverly Hillbillies, all casualties of CBS' shift to watching demographics rather than ratings. The show was produced by Bing Crosby Productions, with the distribution rights currently handled by CBS Television Distribution. This page was last modified on 17 February 2019, at 14:10.